Valentine’s Day seems synonymous with knights on white horses coming to rescue damsels in distress. Or not. Maybe it’s a dreary day filled with what-ifs and if-only-I-would-haves. If February 14 leaves you feeling empty and blah, maybe it’s time to kiss Valentine’s Day goodbye. Valentine’s Day has lost it’s meaning—it’s just another day filled with holiday hype and cheap hyperbole. Valentine’s Day produces more angst and agony than joy and jubilee. No matter what, someone ends up feeling like a looser—but it’s not the businesses that cater to the Valentine’s Day craze that lose out. Americans will spend over $18 billion on Valentine’s Day related merchandise and services (cards, candy, flowers, jewelry, eating out, etc.). Therein lies the problem. Performance pressure starts young—schools offer ‘Secret Valentine’s’ (cards, candy, roses, balloons, you name it) for sale as fund-raisers in the week leading up to the day. First graders talk about whether or not they think anyone will send them a Valentine’s Day card. What six-year-old needs that kind of pressure? And so teachers send home notes requesting that children bring a card for every child in the class—how does that make anyone feel special? Here’s a list of things you can do year-round to make the people in your life feel loved. 1. Start by discovering the love languages of people in your life. Gary Chapman offers several free assessments on his website. 2. If you’re like me, you might find it hard to remember to act intentionally in someone else’s love language—so set repeating reminders in your phone or write them in on your calendar. 3. Go ahead and buy pink and red paper and cut out hearts, but use them year round to leave notes for those whose love language is words of affirmation. 4. Commit to doing one nice thing a week for the person in your life whose love language is acts of service. Fill their car with gas or surprise them by doing a chore that they usually do. 5. Give meaningful gifts to your loved one who has receiving gifts as their major love language. They can be home made or purchased—don’t save them up and only dole them on special occasions (imagine only telling someone you loved them on their birthday, Christmas and Valentine’s Day). 6. If spending quality time with you makes someone you care about feel loved, than make a point to schedule dates and activities with that person. Meet for coffee or a walk in the park or commit to watching their favorite show with them. 7. One of the easiest love languages to learn is appropriate physical touch and affection. Hold hands. Give more hugs. Lean in and touch them when you talk to them. Don’t be afraid to give high-fives or fist bumps. 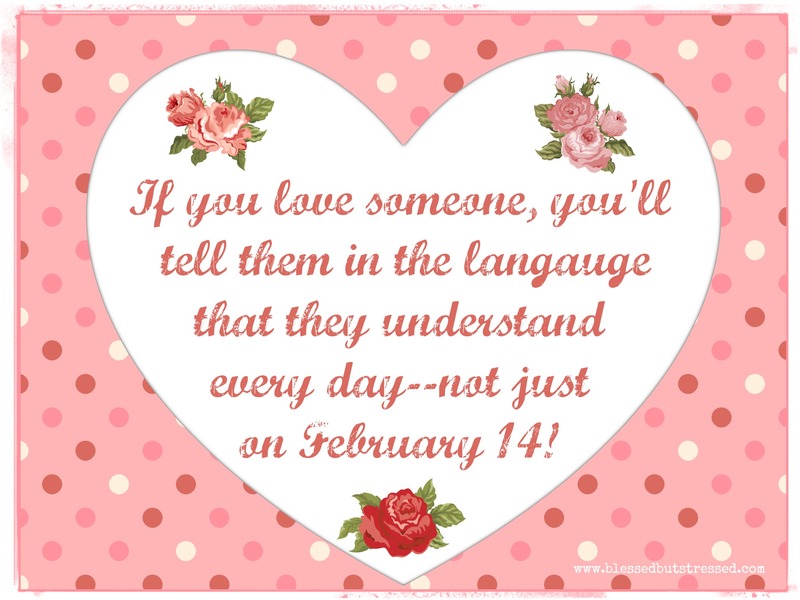 If you really love someone, you’ll take the time to learn to speak his or her love language—even if it doesn’t come easy for you. And that, my friend, is worth more than all the cards, chocolate, roses, swanky nights out or jewelry. What about you? How do you show love to the special people in your life?